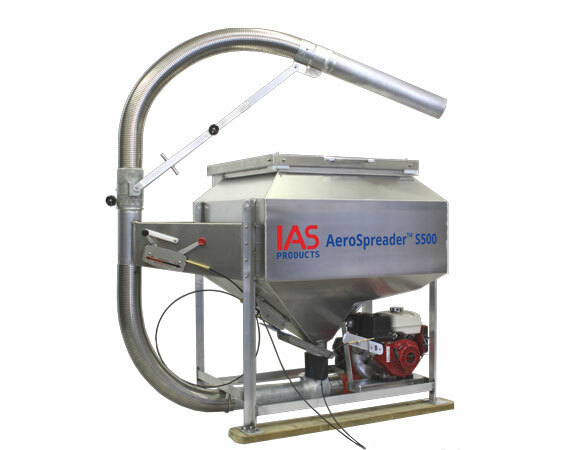 The AeroSpreader™ S500 is our smallest hopper sized stationary or mobile model dry pellet feed broadcaster designed to handle 2.0 to 11.0 mm extruded feed pellets using a 9.0 hp Honda® motor direct driving an Aerite™ AB150 model blower. The 500 kg. (1,100 lb.) capacity marine aluminum hopper is specifically sized to work with this larger Aerite™ AB150 model centrifugal blower to provide operators the benefits of maximum feed rates and broadcast distances from a feeder sized for operation in tight, restricted areas. 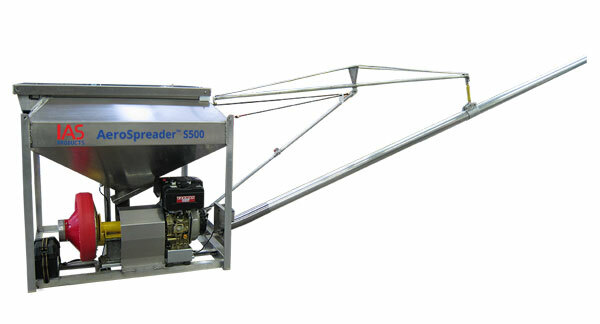 The AeroSpreader™ S500 is available as a compact mobile feed broadcaster with large pneumatic wheels for quick and easy farm site maneuvering. Alternatively as a stationary model this feeder is equally at home positioned on a pickup truck, trailer or marine vessel. Options include remote stainless steel cable controls for operator control of feed blower speed and feed delivery rates. This size feed broadcaster is the ideal operating platform from which to mount a range of feed broadcast hose configurations from the self-supporting 360-degree manually aimed Periscope Feed Head shown here to operator set, automatically oscillating Periscope Feed Head broadcast nozzle assemblies for optimum hands free feed broadcasting. Easy operator maintenance and repair when out on farm site. A direct drive Aerite™ AB150 model blower requires no belt/pulley adjustments. Provides 360-degree feed outlet nozzle aiming so that it is easier to adjust the feeder’s feed outlet nozzle than reposition the vessel or feed truck. Feed four cages from one feeder. 90 kg. (200 lb.) maximum per minute for 9 mm feed pellets. Note that feed delivery rate increases as feed pellet size decrease. 6.75 Kw (9 HP) gasoline powered Honda motor. Optional electric start.